You already know of the all-natural, go-organic craze that’s sweeping the beauty industry today. We even named the top 15 organic and natural products you must have in your boudoir. One of them is the Mineral Flowers line of all-natural and paraben-free skin care products from Israel. Mineral Flowers has different variants, each blended with rich flower extracts that cater to a specific skin type. The Camomile line is for sensitive and very dry skin, while the Rose and Geranium line is for normal and mixed skin. The Almond Blossom line is for dry skin. All variants are formulated with 26 unique minerals from the Dead Sea that help keep skin velvety soft and silky smooth without the harmful effects of chemical ingredients. Its unique texture and composition is meant to draw moisture from the external to the inner layers of the skin. Imagine if you can have that kind of skin pampering in your already rejuvenating massage—it would be heavenly! Your skin would look and feel even softer, it would smell lovelier, and it would be better cared for with the all-natural ingredients in Mineral Flowers. That was probably what The Spa was thinking when it collaborated with Mineral Flowers to give its customers an upgrade to their already blissful spa experience. The Spa offers a wide array of services--massage therapies, facial, foot, and body care treatments. But, a lot of their customers have been asking for all-natural skin products to be used in their treatments. Now, all branches of The Spa offers the Go Minerals upgrade: The Spa treatments can be upgraded to use Mineral Flowers products with additional cost, depending on the service provided. So, if you desire to be pampered luxuriously with all-natural products, ask the attending personnel at The Spa for the Go Minerals upgrade. Any The Spa branch, but you may want to try their bigger and less crowded branch in Acropolis, at Acropolis Center, Acropolis Green Subd., 80 E. Rodriguez, Jr. Ave., Bagumbayan, Quezon City (right across Eastwood). If you’re with your guy: Get a 60-minute Aromatherapy Massage (additional P300 on your treatment). Ask for a cozy and super private couple’s room and enjoy this absolute must-try! 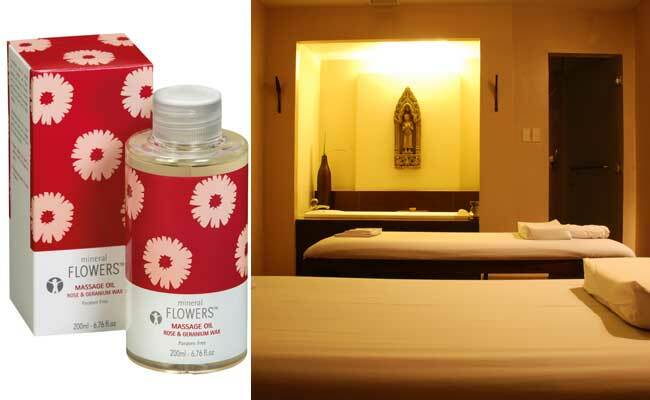 Experience a soothing massage and treatment in one with Mineral Flowers Massage Oils. Any variant you choose would help repair the skin and leave it softer, smoother, and more supple. You would love the scent of Rose and Geranium (it’s a romantic scent that would absolutely turn him on when he gets a whiff of it on you), while he might appreciate the Camomile fragrance. Or, you could match and both ask for the Almond Blossom massage oil, which has a light, sweet fragrance. If you’re on your own or with girlfriends: Try their Nail Care services, which, when upgraded, uses Mineral Flowers Massage Milk for feet and Hand Cream for hands (additional P70 for pedicure, P90 for manicure, and P150 for manicure and pedicure). Whether solo or as a spa party, relish the extra-special care that your nails, hands, and feet will be treated to with the Mineral Flowers upgrade. The gentle care from Mineral Flowers massage milk will effectively soothe tired and dry or cracked feet, and keep it soft and smooth for days. Those whose hardworking hands (from all that typing and writing, among other things) deserve the moisture-rich hand treatment that uses the ultra-nourishing Hand Cream. Getting an upgrade is truly worth it, especially if you want to try something delightfully different from the regular massage oils and creams usually used in spa treatments. Even your guy would appreciate the difference Mineral Flowers’ products would have on your usual couple pampering sesh. Meanwhile, we recommend that you enjoy your Mineral Flowers Nail Care service without asking for a polish application. Their nail services are best enjoyed for the lovely way they make your hands and feet look and feel: velvety soft, smooth, and beautifully clean. Make those pretty hands and feet stand out, and flaunt them for their natural beauty—sans the colored polish. It will look and feel that way for days. The Spa’s luxurious Body Polish (additional charge of P150 for the 60-min. treatment) is best capped with Mineral Flowers Body Butter to moisturize and hydrate your glowing skin. Also try Mineral Flowers Facial Treatment (P750, 30 min. ), a unique facial treatment infused with minerals from the Dead Sea and flower extracts rich in antioxidants. This complete facial cleanses, firms, energizes, and enhances skin repair. It also improves natural skin regeneration, making skin soft, smooth, and rejuvenated. You’ll look and feel instantly younger the moment you walk out of The Spa!